Clap Your Hands Say Yeah In Concert Hear the quirky and ever-addictive Clap Your Hands Say Yeah recorded live in concert from Washington, D.C.'s 9:30 Club. Clap Your Hands Say Yeah bring their quirky and ever-addictive brand of artful, indie pop to Washington, D.C.'s 9:30 Club for a full concert, originally webcast live on NPR.org March 8, 2006. The Brooklyn-based group is known not only for its passionate, inspired music, but also for redefining the art of do-it-yourself record production and promotion. 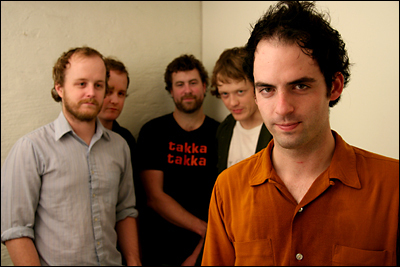 They released their self-titled debut CD on their own label (also called Clap Your Hands Say Yeah), distributed it to stores and radio stations and promoted it through their Web site entirely on their own. 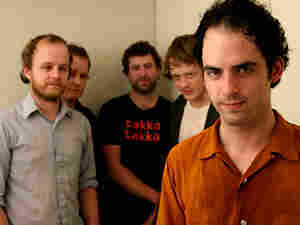 The subsequent online buzz and airplay shot Clap Your Hands Say Yeah to what counts as major stardom in indie music circles. According to the band's official bio, "Clap Your Hands Say Yeah was conceived in the belly of the Great Whale. Upon departure, its members floated to shore. Five arrived alive: Alec Ounsworth, Sean Greenhalgh, Tyler Sargent, Lee Sargent, and Robbie Guertin. They are multi-instrumentalists under the age of 48. The live arrangement is as follows: Alec Ounsworth, guitar and vocals, Sean Greenhalgh, drums and percussion, Tyler Sargent, bass and backing vocals, Lee Sargent, guitar and keyboard and backing vocals, Robbie Guertin, guitar and keyboard and backing vocals. Alec Ounsworth lives in Philadelphia, Pa. Sean Greenhalgh, Tyler Sargent, Lee Sargent, and Robbie Guertin live in Brooklyn, N.Y. They are citizens of the United Sates of America. Alec Ounsworth writes the songs for the project in Philadelphia. The songs are then transported to New York (via bus, car, or train), shaped, re-shaped, finally reaching a certain completion that returns again to the belly of the Great Whale and is initially and finally Clap Your Hands Say Yeah."